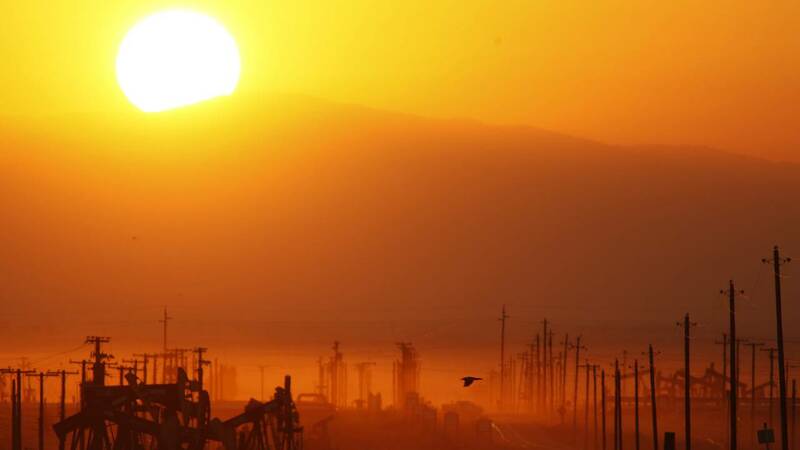 The sun rises over an oil field over the Monterey Shale formation where gas and oil extraction using hydraulic fracturing, or fracking, is on the verge of a boom on March 24, 2014, near Lost Hills, California. Many premature deaths around the globe are due to air pollution, which can cause heart, lung and other diseases. New research suggests that a rapid reduction in air pollution emissions would save millions of lives. Worldwide, 3.61 million people are dying each year due to outdoor pollution caused by fossil fuels, an international team of researchers estimates. Fossil fuels, including coal, oil and natural gas, are responsible for about 78% of global greenhouse gas emissions, according to the US Environmental Protection Agency (and about 76% of US greenhouse gas emissions). An additional 1.94 million premature deaths occur as a result of air pollution from other sources, including residential energy use and agricultural activities, according to the authors. Beyond the direct health benefits, rapidly decreasing fossil fuel emissions would increase rainfall in drought-prone regions and boost food security, they say. "The mutual goals of clean air and a stable climate under the World Health Organization guidelines and the Paris Agreement require a rapid phaseout of fossil fuels," wrote the authors of the study, published Monday in the Proceedings of the National Academy of Sciences. The 2015 Paris Agreement aims to limit global warming in the 21st century to between 1.5 and 2 degrees Celsius (between 2.7 and 3.6 degrees Fahrenheit). A phaseout of fossil fuels is required to prevent temperatures from rising beyond this internationally agreed goal, according to the authors of the study, while some scientists argue that removing carbon dioxide from the atmosphere and using other geoengineering techniques may also be required. For the new study, the researchers used a global model to estimate the climate and public health outcomes attributable to fossil fuel use. Each year, between 2.96 million and 4.21 million premature deaths occur due to outdoor air pollution caused by fossil fuels, according to their analysis. In the United States alone, there are 194,000 annual deaths due to these causes, while China sees 1.6 million deaths and India 692,000 deaths. "Globally, fossil-fuel-related emissions account for about 65% of the excess mortality," the authors wrote. These emissions also account for nearly 70% of climate cooling, they say. Removing fossil fuel emissions would increase "rainfall by 10-70% over densely populated regions in India and 10-30% over northern China, and by 10-40% over Central America, West Africa, and the drought prone Sahel," they wrote. (The Sahel is a region of western and north-central Africa that includes Burkina Faso, Chad, Mali, Mauritania, Niger and Senegal. It has been suffering from chronic food shortages caused by economic crisis, poverty, desertification and climate changes since the early 1970s.) This substantial increase in rainfall would result in greater water and food security, they say. If air pollution and greenhouse gases are removed at the same time, there will be a slight uptick in "unavoidable near-term global warming," according to the authors. Their results suggest that it is very "unlikely" that the Paris Agreement temperature limit can be achieved without "massive extraction" of carbon dioxide from the air. "However, with a phaseout by midcentury the 2 °C goal may still be within reach." Nick Obradovich, a research scientist at MIT's Media Lab, agrees with the "main upshot" of the new study that "fewer people will die if there's less particulate matter in the atmosphere." This is not the first time we've heard this, but the study seeks to give "more precise estimates" on that front, said Obradovich, who was not involved in the research. Anytime scientists create a mathematical model and come up with exact numbers for what may happen, it is subject to approximations and estimates that may not be correct, he noted. Scientists "bake into the model" any number of assumptions, such as that all of us will spend a similar amount of time indoors as we do now and that most of us will not walk around with face masks. For this reason, he cannot say whether the numbers themselves are correct, but he agrees that "you will save people's lives if you do reduce pollution." Obradovich noted one "pretty big omission." The study authors acknowledge that If you pull particulates from the atmosphere, you will increase short-term global warming. However, they do not explain that an increase in average temperatures around the globe will increase deaths, he said. This detail bears mention, he said, even though it's very likely that there will be more lives saved by reducing air pollution than lives lost due to higher average temperatures. What's an individual to do? Although individual changes matter -- such as driving less -- it's long-term policy and technology changes that will have the most lasting effect, Obradovich said: "I think the way to solve these problems is to get engaged politically."